This tutorial describes how to mark a mail domain as a backup MX. When smtp service on primary MX server is down, emails will be delivered to backup MX server. 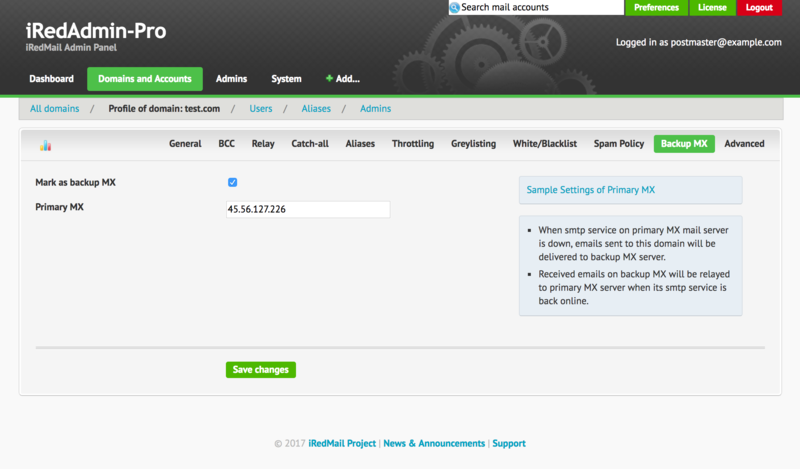 When backup MX server detects smtp service on primary MX is back online, it will relay received emails to primary MX. To let other mail servers know your server is the backup MX server of this mail domain, you must add your mail server info in its MX type DNS record. For example, main mail server of your mail domain example.com is mx01.example.com, to set your iRedMail server mx02.example.com as backup MX of example.com, you need to add mx02.example.com as your lower priority mail server in MX type DNS record. Server mx01.example.com has priority number 5, and mx02.example.com has priority number 10. For mail service, the lowest number has highest priority. so with above example, server mx01.example.com is the primary MX, and mx02.example.com is a backup MX. When mail service on mx01.example.com is down, other mail services will connect to mx02.example.com. You should set the IP address of primary MX as relay server to avoid mail loop. In above example, we mark domain example.com as a backup MX, and use IP address 45.56.127.226 as primary MX server, you should replace it by the real IP address.